There's a nationwide nursing shortage and it's affecting patient care in Illinois as much as anywhere else. Reasons for the shortage are varied, including an aging population and lack of qualified nurses ready to replace the older, soon-to-retire baby boomers. In fact, a 2014 State of Illinois survey found that 40 percent of the Illinois RN respondents were 55-65 years of age or older, and that of this group, one-third intended to retire within the next five years. The shortage of RNs in Illinois is likely to have a ripple effect on other types of nurses, including LPNs. This makes now a great time to pursue a practical nursing career, and there are a number of excellent LPN programs in Illinois to choose from. If you think an LPN career might be for you, read on to explore programs, learn more about specific licensure requirements for Illinois, and get detailed information on employment and salary for the state’s LPNs. LPN programs in Illinois are offered through vocational centers and, most prominently, on community college campuses throughout the state. The search tool below provides a great way to start looking for the program that best suits your individual preferences. For a detailed comparison of your top picks, click the compare schools option at the top. In order to legally practice – and find employment – practical nurses must be licensed by a governmental entity, typically the state’s board of nursing. Most states have a dedicated Board of Nursing, while others may have a larger organization that oversees all types of licensing. In the case of Illinois, the state’s board of nursing falls under the Illinois Department of Professional Regulations (IDFPR). This section takes a look at the requirements that must be met to obtain an LPN license to practice in the state of Illinois. There are two basic ways to satisfy the education and training requirements to become a LPN in Illinois: 1) Graduation from an accredited nursing program that satisfies Illinois requirements or 2) Obtaining education, training and licensure from out-of-state that meets Illinois state requirements for licensure through endorsement. In either case, an individual will need to successfully graduate from an approved LPN program. Specific course and graduation requirements vary from school to school. A typical LPN program in Illinois will take a minimum of one year to complete, but many schools offer extended programs of 16, 18, 20 months or longer to accommodate working students. In addition to specific LPN program requirements, students must normally complete a number of general education courses, which may be taken as part of a community college LPN associate degree or certificate program, or at a community college to satisfy a nursing school admissions prerequisite. Submit a verification of fingerprint processing from the Illinois Department of State Police or its designated agent. Fingerprints to be taken within 60 days prior to application. All Illinois LPN licenses expire on January 31 of each odd-numbered year. License holders may renew their licenses during the month preceding the expiration date by paying the required fee, currently $40, and completing 20 hours of continuing education (CE). LPNs who have been inactive or had an expired license for more than five years must reapply for their license, submit proof of fitness to practice, and pay a license restoration or renewal fee. Illinois is a state of big contrasts, particularly when it comes to population. Largely made up of farmland and small communities, Illinois is also home to Chicago, the nation's third largest city. As a result, LPNs in Illinois will encounter wide variations in terms of salaries and job opportunities depending on where they practice. The charts below indicate where the highest salaries for LPNs can be found in Illinois. Five years ago, the state of Illinois was predicting a small but significant surplus of LPNs. And while some studies continue to indicate a surplus of LPNs, those same studies also make clear that these estimates apply to the traditional role of LPNs and do not take into account emerging care delivery models which are expected to contribute to new growth and demand for LPNs. The data below offers a more detailed look at emerging trends for LPNs in Illinois. An affiliate of the National Black Nurses Association, the GIBNA's mission is to, "promote health and wellness, health education, improved quality of life for all persons, especially persons of color, and to promote diversity within the nursing profession." The IASN is the only state organization in Illinois specifically geared toward school nurses. This website offers members and non-members access to information on a number of topics including licensure/endorsement, continuing education and career opportunities. The State's official site for information on nursing education, licensing, careers and more. 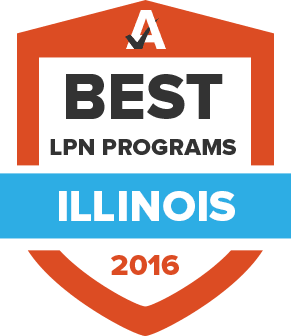 An excellent place to start any search concerning LPN practice in Illinois. The IDFPR is responsible for the administration of licensing for practically every profession in the state, including the licensing of LPNs. This is where you will find all information regarding LPN licensure including all application forms and directions. The state chapter of the National Association of Hispanic Nurses, the IHNA provides its member with career support, organization events, scholarships and more. The INA is the state's nurses' union. Among typical union tasks such as collective bargaining, the INA offers continuing education opportunities and association events to support its members. An affiliate of the American Organization of Nurse Executives. The IONL offers members a variety of services including networking with other members, continuing education programs, conferences, webinars and more. The INAI's goal is to identify and meet the "professional, cultural and social needs unique to nurses of Indian origin and heritage." The association sponsors continuing education programs, social events, workshops and more for its members, new graduates and nursing students. The purpose of the PNAI is to unify Filipino-American nurses in the state, provide professional development and to encourage membership participation in professional, educational, cultural and legislative activities. The SNAI support student nurses in the state through its annual conference and other networking opportunities.